Yosemite Forum • View topic - Yosemite Miwok - Mewuk transplanted Walla Walla Indians? Yosemite Miwok - Mewuk transplanted Walla Walla Indians? Before the journalist Stephen Powers wrote that the Yosemite area Indians around Mariposa, Tuolumne, Stanislaus, Merced and Madera went by the name Mewuk, the Indians in that area went by the name Walla Walla, Walla, Walli or Wallium. We had heard an old story by a Washoe-Paiute elder that when Powers was doing his story he asked a Walla what he was and the Walla replied "Me Wah"...and the rest is history. We thought that it might have been a joke, but now we wonder. The Walla Walla are Oregon - Washington Indians who came in with the white settlers and pioneers as they were moving into California in the mid 1840s. This a documented fact of early California history that the Walla Walla from Oregon-Washington were in the San Joaquin Valley, but what happened to them? Well many of them stayed. Whites who came in after the gold rush in 1849 saw the Walla and assumed they were the indigenous Native population. Before you say "That is crazy", let's see what this booklet says. 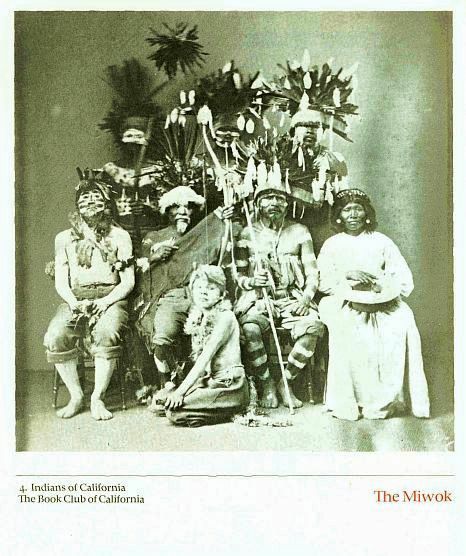 The booklet called "The Miwok" was created by The Book Club of California in 1973 and written by Donald I. Segerstrom who's family were early pioneers and settlers of the Sonora area foothills. Under section 107 of the copyright law of fair use we will examine some of the quotes in booklet "The Miwok" for educational research of the Indians of Yosemite and not used for sale. The Segerstrom family collected many photos of the Miwok in the foothills around Yosemite and Hetch Hetchy, and they also knew the Miwoks of the area. The photo on the cover of "The Miwoks" was from the Segerstrom collection. "Their language was a muttered, guttural, soft spoken tongue. The only words that would be intelligible to the Caucasian would sound like "Walla Walla." For a time the whites though 'The People' wanted to be called Walla Wallas. This would later be corrupted to "Wally" or "Wallies" when referring to the Miwoks. Many was the time in later years the whites would refer to an area as looking like "a Wally camp". "...the name "Diggers," Digger - Walla Wallas - Wallies - Miwoks - they were 'The People'".